We had a great stay at the Inn. Everything was exactly as was pictured. Ed and his staff made us feel very comfortable. Dee (the housekeeper) is a wonderful asset to the inn with her awesome toilet paper art. Love the dogs as well. 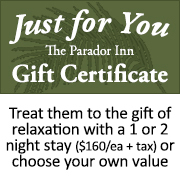 Would, will and already have recommended the Parador to anyone looking to stay in Pittsburgh. Thanks again for everything!